Crimson Storm Soccer won the regular season championship. 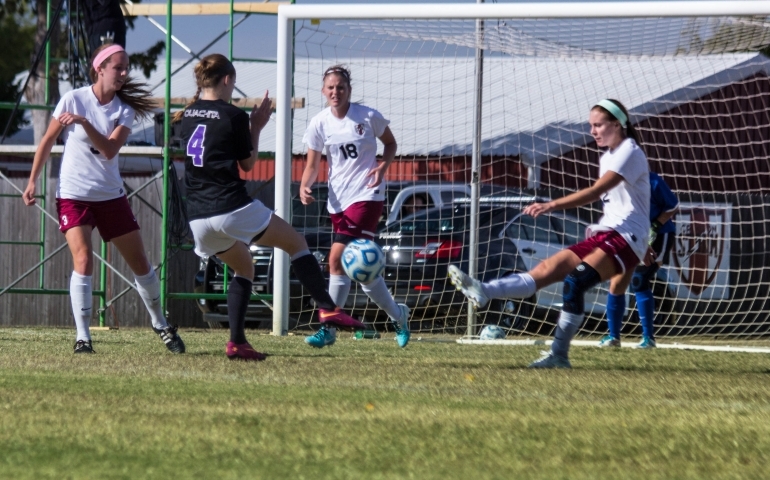 Last weekend, Crimson Storm women’s soccer team lost 0-1 in the GAC championship game. This was the first GAC championship in school history, and SNU was able to host the tournament. Crimson Storm was the first seed in the tournament. The Crimson Storm (10-8, 8-2 GAC) entered the GAC tournament with a 4-2 record against ECU, Harding and Ouachita Baptist this season. In the Championship game, Southern Nazarene put ten of their 28 shots on goal but were unable to score. The Crimson Storm controlled most of the second half in possession as they attempted 20 shots compared to only two for the Tigers. They put eight of those shots on goal and had a couple of chances to tie the game throughout the second half. In the first game, SNU beat out ECU 4-1 with penalty kicks. Both teams scored in regular play. Then, the Tigers controlled the first overtime period and did not allow the Crimson Storm to attempt a shot. The script flipped in the second overtime period as Southern Nazarene did not allow East Central to attempt a shot. They attempted five shots but were unable to put any on goal. Mallary Pineda, Breana Harris, Bekah Stewart and Grace Self scored, giving SNU the win. Southern Nazarene is ranked highly within the GAC in a couple of categories. They are second in goals with 33, second in assists with 23 and second in points with 89. SNU had three players named to the All-GAC First Team, Breana Harris, Mallary Pineda and Bekah Stewart and three players named to the All-GAC Second Team, Alyssa Glitzke, Hannah Robinson and Grace Self. The Crimson Storm also received the Freshman of the Year award for Hannah Robinson and the Coach of the Year award for Julie Duncan.